Novell Client 2 for Windows Vista/, view, size, last update. Readme · html, 09/23/ Novell Client 2 for Windows Vista/ Quick Start. The Novell® Client™ for Windows Vista* provides Windows connectivity to NetWare® and OES Linux servers. With the Novell Client, you can. This client supports 32 and 64 bit versions of Vista. Novell Client for Windows Vista · patches for the Novell. Novell Client 2 for Windows Vista/ Download pflp-info.de Download? d=BALmEAJX8TQ~ Novell Client 2 for Windows. The Microsoft Windows Server platform is now supported by the Novell Client, in addition to the Microsoft Windows Vista platform. The utilities that return these errors are bit applications, and bit support is completely absent in the Novell Client for Windows Vista. Novell Novell client for windows vista 2 SP1 IR6 and later supports a new mechanism through which administrators can configure non-Novell-aware Windows novell client for windows vista to be capable of authenticating to eDirectory, and therefore able to access Novell NCP-based volumes and paths. Configure the Windows service to start using a specific Windows user account. 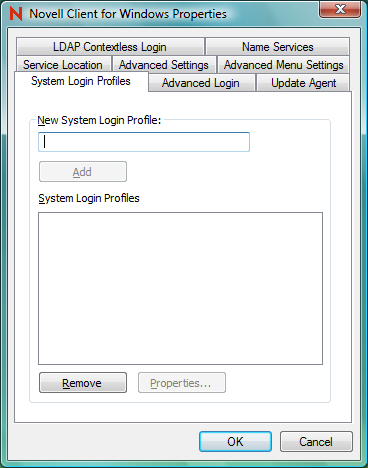 The Windows user account used for the service is configured from the Windows "Services" control panel applet, by opening the properties of a specific service and specifying "This account: Ideally the Windows user account specified would not be a Windows user account which is also being used for normal interactive login, and would be created and granted necessary permissions strictly for the use of running a particular Windows service. Login to eDirectory is not supported for services running as "the Local System account", which is what most services run as by default when not configured with a specific Windows user account. Within the Windows user account-specific subkey, create all of the following required registry values. These values are required novell client for windows vista the eDirectory login mechanism to engage. If one or more of these values is missing, the eDirectory login on behalf of the Windows service will be disabled: This is required for the eDirectory login configuration to be honored. If this configuration needs to be temporarily disabled, this value can be set to 0x without having to remove any of the other configuration values. Specifies the complete distinguished name DN of the eDirectory user account to login with. For example, "AntiVirusUpdate. This eDirectory user account name does not have to match the Windows account name being used for the Windows service logon. Specifies one or more eDirectory tree names for which login should be attempted on behalf of the Windows service. You can enter a specific NCP server name, DNS name or string form of the IP address instead of the actual eDirectory tree name, in order to better control which eDirectory replica is used for this Windows service login to eDirectory. Note that the same eDirectory user account DN and password will be used for each eDirectory tree authenticated on behalf of this Windows service. Within the Windows user account-specific subkey, optionally create one novell client for windows vista more of the following additional registry values. These values are optional, and absence of these registry values will not disable the eDirectory login on behalf of the Windows service: If specified, contains a clear-text version of the password for the eDirectory user account specified in "DefaultUserName". If this value is NOT created in the registry, the Novell Client will default to attempting to login to eDirectory using the same password as was specified for the Windows user account in the Windows service araxis merge portable adobe On" configuration. Keeping the eDirectory user account password and Windows user account password in sync and then NOT creating the "DefaultPassword" value in the registry is the recommended approach, to avoid the security implications of a clear-text password saved in the registry. Now use the Windows "Services" control panel applet to stop and re-start the Windows service; or simply restart the Windows machine entirely. The next time Windows starts the configured service, in addition to Windows creating a Windows account logon session for the Novell client for windows vista user specified in the "Log On" configuration, the Novell Client will also attempt logging into eDirectory as the specified user account in the specified eDirectory tree s.
If the eDirectory login is successful, the Windows service will be able to access UNC paths of file and volume resources on servers within the specified eDirectory tree sfor whichever volumes and paths the eDirectory user account has been granted file system trustees. There will not be any eDirectory login script processing performed for this eDirectory login on behalf of the Windows service account; only UNC path access will be available. By default this feature will not be enabled. Only by explicitly creating the Novell Client configuration described above will an ofp infantaria brasileira adobe user account logon be attempted on behalf of the Windows service. This type of "automatic" login attempt without pre-configuration is not available on the Novell Client for Windows 7 or Novell Client for Windows Server R2. This feature is not designed or intended to work for services configured to run under "the Local System account" instead of an actual Windows user account. The Windows service must be configured to run novell client for windows vista a specific Windows user account in order to use this eDirectory login feature on the Windows service's behalf. With the eDirectory logon performed for Novell client for windows vista services in the Novell Client 2 SP1 IR6 and later, the eDirectory logon occurs during Windows service startup, at the same time Windows is calling LogonUser to create the specific Windows user account logon session under which the Windows service will be running. The eDirectory login attempt processing occurs only once, and only during the Windows service startup. The Novell Client will wait for the Windows network interfaces to become available, and will retry for a short period of time if "Tree or server not found" conditions are encountered during the eDirectory logon attempt. But if the eDirectory logon attempt ultimately fails for any reason eDirectory tree can never be found, account password is incorrect, etc. There will be no future attempts or retries while the service is running, until the Windows service is shut down and then started up once again. When the Windows service is running, the eDirectory authentications and NCP connections created on behalf of the Windows service are "private" to just that one instance of the running Windows service. The Windows service does not "see" or interfere with the NCP connections and eDirectory logins that are performed by interactive Windows users logging onto the same machine, nor do the Windows services "see" or interfere with the NCP connections or eDirectory logins of other Windows services. The same Windows user account can actually be specified on two or more Windows services, and each of those services will have an eDirectory login performed on their behalf. But these Windows service logon novell client for windows vista are still considered separate, and are not shared or visible between Windows service instances. This is something that would be designed and done by the application vendor, and not something an administrator can arbitrarily add to a Windows service application. Once logged into eDirectory, the Windows service application can expect that attempts to access UNC paths to Novell files and volumes within that tree will be able to successfully authenticate and access whichever paths the specified eDirectory user account was granted trustee assignments to. If the Windows service application permits the administrator to define what credentials user account name and password and path will be passed to the WNET API, novell client for windows vista a Novell eDirectory user account DN and Novell server-based path can successfully authenticate the service to eDirectory. The Windows WNET APIs will employ each of the installed Windows-compatible network providers until one of them successfully authenticates with the credentials and path provided, so when the Novell Client network provider gets called, it will be able to employ the eDirectory user account DN to login and authenticate to the eDirectory tree and server represented by the target path. Instead of requiring any separate eDirectory user account logon, the Windows service would attempt Windows-level authentication to the remote CIFS service using the Windows user account credentials specified in the Windows service's "Log On" configuration. The Windows service application may be designed such that it intends to impersonate logged-on interactive users, and to act on the interactive user's behalf including use of the interactive user's existing eDirectory and NCP connections. As such the Windows service itself may not ever be logged into eDirectory, but at the times where eDirectory access is needed, the Windows service code was already intentionally impersonating the interactive Windows user logon session, and therefore has that user's eDirectory logins and NCP novell client for windows vista available. The simplest example of this is the Windows Print Spooler service. EXE does not actually login to eDirectory on its own Windows service process. But users, novell client for windows vista are logged into eDirectory and other remote resources, call the Windows Print APIs which call down to the Print Spooler service under impersonation. Whatever eDirectory or other remote resources the interactive user novell client for windows vista can access defines which printer s the Print Spooler service will be able to access on their behalf. The Windows Print Spooler service itself was not required to login to any eDirectory or other remote resources. The Service Account eDirectory Login configuration will use the Novell Client properties settings, same an an interactive user would. The file system features like File Caching and File Commit have no idea how the eDirectory login was originally performed. Those settings will be honored regardless of how the eDirectory login is performed. The translated version of this page is coming soon. In the meantime, content will appear in standard North American English. Document ID: To configure a Windows service for authentication to eDirectory: Don't show this message again.